KL Tower BASE Jump 2014 took place from 26th to 29th September. It included 4 days and 3 nights of BASE jumping. 108 BASE jumpers from 20 countries completed over 3200 BASE jumps. This is a new record for the event. Sabah BASE Jump 2014 took place on 13th and 14th September. Jumping was off Menara Tun Mustapha on the island of Borneo in Kota Kinabalu, Sabah, East Malaysia. 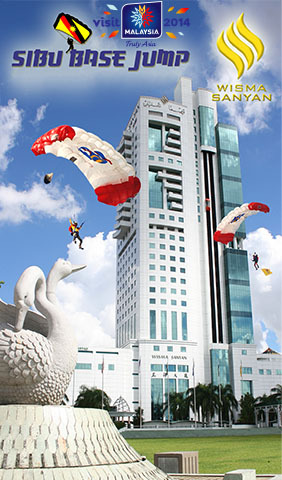 380 BASE jumpers were completed by 32 BASE jumpers of Menara Tun Mustapha. Sabah BASE jumping was followed by 2 fun filled adventure days which included white water rafting and snorkling. Sibu BASE Jump 2014 took place from 18th to 21st September. Jumping was off Wisma Sanyan on the island of Borneo in Sibu, Sarawak, East Malaysia. Standing 126 meters high Wisma Sanyan is the tallest building in East Malaysia. Over 3 days of BASE jumping 776 BASE jumping were completed by 42 BASE jumpers off Wisma Sanyan. On the final evening BASE jumpers were treated to a closing dinner and celebreation at a traditional longhouse. The management of Gua Damai Extreme Park opened up their 96 meter cliff for BASE jumping during the days of 23rd and 24th September. Gua Damai is about a 20 minute drive north of KL Tower.